Around the turn of the 21st century a few subdivisions were created on land between other older neighborhoods. One of these in-fill neighborhoods, Rivershore, is made up of nine lots. 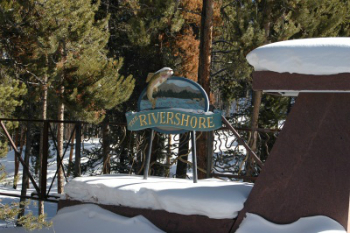 Unlike many of these – Rivershore’s lots are larger – an acre or more – and the main road is paved as are the driveways. This land is relatively flat on the shore of the Blue River River, and make for easy and stable home building. A large number of native trees were left in place, and so an Rivershore home for sale will have a sheltered, and private feeling. Start your search for a stunning custom home with the Rivershore real estate listings below, or keep reading about the neighborhood. Big custom built homes, built since 1998 when the Rivershore subdivision was developed. It is a gated at its entrance from Highway 9, but this is not fenced along the entire perimeter boundary, part of which is the Blue River. Fishing and boating on Goose Pasture Tarn are privileges given to every resident of Blue River including those at Rivershore. Additionally, these homeowners have private fishing rights on the stretch of the Blue that runs along the backside of this neighborhood, which is just a few yards from Highway 9. Downtown Breckenridge is an easy, 5-minute drive and so are the trailheads for Spruce Creek and the Mohawk Lakes, the Blue River Trail, Fredonia and McGullough gulches, Pennsylvania Creek and Quandary Peak – Summit’s only 14er – is within sight. Size: 3142 sq. ft. to 3491 sq. ft. Amenities: inexpensive, efficient floorplan, parking, close to trails, near bus route, is walkable to or from downtown. From the traffic circle on the north side of Breckenridge drive south on Highway 9 through town, continue approximately 2 miles from the Boreas Pass light and River shore will be on your left just after Wagon Road. 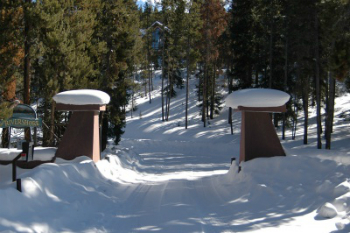 Look for the gate and pillars and you have arrived at Rivershore Drive. If you reach Lakeshore Drive of see Goose Pasture Tarn on your left you have gone too far. An expert from Breckenridge Associates is waiting to answer your questions. Send us a message online or call us at (970) 453-2200.